Rolling Stones guitarist Keith Richards’ hedonism is legendary. He has been known to have had acid-fueled orgies and partied while jacked up on heroin, pills and, of course, booze. Lots and lots of booze. 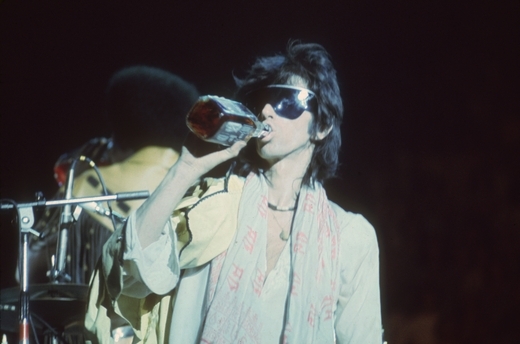 Just look at him nonchalantly swigging from a bottle on stage. But it appears like Richards’ boozing days are behind him as the 74-year-old reveals he’s given up drinking. Richards isn’t the only formerly indulgent celeb to come out about curbing their drinking habits as they get older. Wrestler Ric Flair — who has been cleared to fight again at age 69, a year after being put in a 12-day coma — said he doesn’t drink anymore. And while the Texas Rattlesnake might be much younger, 53-year-old “Stone Cold” Steve Austin said he’s no longer crushing beers over his head and has given up booze in favor of good health. Don’t want to give up drinking like these guys? Here’s how to drink healthier.